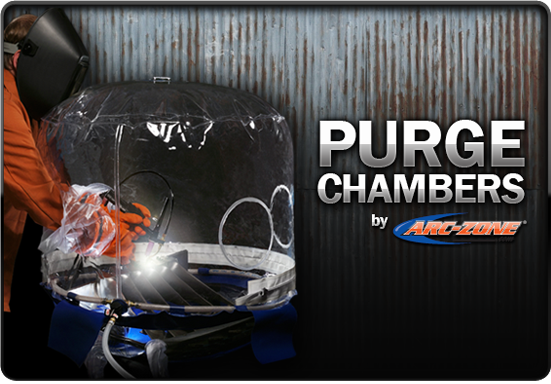 Purge gas chambers are engineered to deliver a consistent shield gas environment for increased weld-quality, consistency and reduced post-weld clean up. The patented Flexible Purge Chamber is used in the GTAW (Gas Tungsten Arc Welding) and TIG (Tungsten Inert Gas) welding process. Designed to provide a pure inert atmosphere for the precision welding of reactive metals such as titanium, molybdenum, nickel-based and aluminum-based alloys, as well as non-reactive metals like stainless steel. 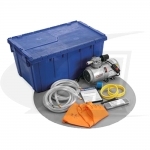 Built to quickly and easily draw a vacuum around the part to be welded by collapsing the flexible chamber. The chamber is then filled through a gas distribution hose that encircles the base of the chamber. This purging process allows the argon gas to expel all atmospheric gases more effectively (through the top valve port) than traditional filling methods. This process significantly reduces the time and expense required to reach an inert atmosphere suitable for welding, while using considerably less gas than traditional rigid purge chambers. *Standard size is 30" diameter with a 24" base -- Note: Special sizes, shapes and glove configurations available. Contact Arc-Zone.com Customer Care for help getting you the chamber needed for your TIG welding application and budget.